From recipe creator Brook Hurst Stephens of Learn to Preserve, "Pears have a unique, delicate taste and firm texture that make them not only the perfect fruit for canning, but also a wonderful canvas for a variety of flavors. Try adding traditional spices, like cinnamon sticks or vanilla beans, or experimenting with something more unusual, like star anise or whole cloves. 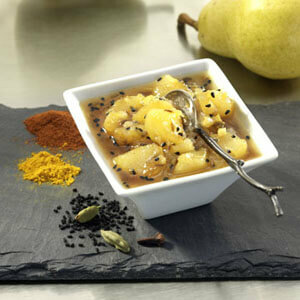 Your home-canned pear halves will be a great base for cobblers and crisps or tasty tossed into a fruit or green salad. You might decide to keep it simple and just serve them in a bowl with nothing added except the fork...delicious!" Mix lemon juice and 2 quarts water in a large bowl. As you prepare each pear half, you’ll place it in this water to keep it from browning. Trim the stem ends of pear halves and discard them. Place pears into bowl of lemon water. 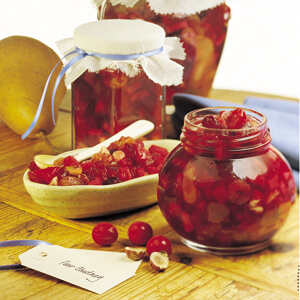 Prepare the syrup by combining remaining quart of water and the sugar in a large (5 or 6 quart) pot. Bring to a boil, stirring to dissolve sugar. Using a slotted spoon, transfer the pears from the lemon water to the boiling syrup. Return to a boil and cook pears in syrup for 2 minutes. Using a canning funnel, pack pears into wide-mouth pint-size jars. When all jars are full, pour the remaining syrup over the pears to cover them, leaving ¼-inch headspace in jars. Wipe the rims of the jars spotlessly clean. Look for any air bubbles and pop them with a plastic knife. Set lids on jars, and screw bands on finger-tight. Process jars in boiling water bath for 20 minutes. Remove jars from kettle using jar-lifter tongs and gently set aside to cool on a kitchen towel in a draft-free place. Let rest for 24 hours, then check for proper seal before storing.